I have 25 tomato plants 3 to 4 feet tall. Leaves on 1 plant are curling up into black balls that look like black Brillo pads. I pulled off all the bad leaves they turned my finger a black green color. A few days later more leaves are curled up and black too. It looks like some type black mold, vinegar is not a cure the black goes all the way through the leaves. Today the stem was black all the way down to the roots so I pulled up the whole plant. Last summer I had a similar problem 1 tomato plant had something I thought was blight so I sprayed it for 6 weeks with Blight Control but it finally died anyway. I am not taking any chances this year if any tomato plants look sick i am pulling them up. It is still raining her almost every day and has been raining and very over cast for 2 months. Temperatures were in the 90s then in the 50s for most of last week, 71 yesterday and 79 today. Has anyone had a problem with plant disease? I'm not familiar with anything like that, but I looked around a little. that's curly top virus in tomato plant. Otherwise turning black is uncommon. Much more commonly tomato leaves would have yellowing or brown spots. Could be the same thing but it looks different. Tomato plants last summer looked like those photos. The main thing is to make sure the infected plant is gone and hope it does not spread to other plants. Several online videos all say the same thing, curly top virus is spread by the leaf hopper bug. Leaf hopper bug is any bug that goes from plant to plant eating plants, worms, flies, spiders, bugs, ants, moth, butterfly, gnats, etc. Once your plant has curly top virus there is no cure pull it up before it spreads to other plants. Last year I planted new plants every 3 weeks from seeds, I had a lot of replacement plants all summer. 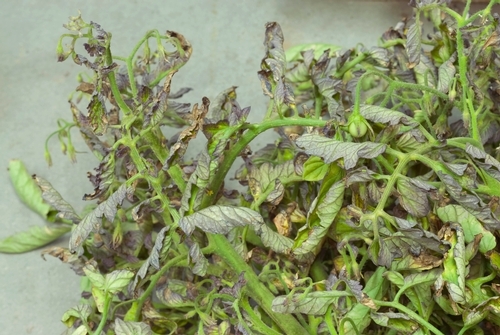 Tomato Plant has Shriveled Leaves - Disease? 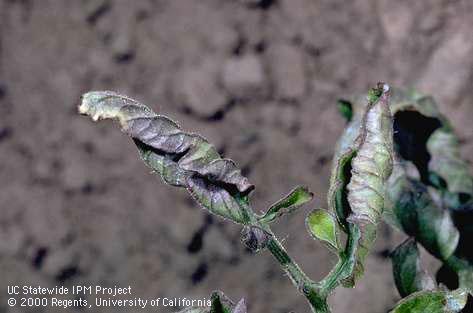 What Does Tomato Disease Look Like?